Daniel Wetzel at German national daily Die Welt here recently commented that limiting the warming to 1.5°C warming is utopian. That’s of course, assuming the man-made global warming theory is correct to begin with. According Wetzel, time theoretically ran out long ago. Even before the report was released to the public, environmentalists and climate activists had already made up their minds that humanity had one last chance to avert calamity. Profound wide-scale action would need to be taken. Green politicians and environmental activists are now demanding a declaration of a state of emergency, it seems. Theoretically however, the window in fact closed weeks ago. He cites Chapter C1.4, footnote no. 14 of the report. According to Wetzel, the UN report also notes that between 900 billion and 1.8 trillion dollars would need to be invested every year from 2015 – 2050 to revamp the global energy system. This is a figure that even the richest nations are going run from. Currently Germany’s Energiewende alone is costing Germany 34 billion euros annually. Worse, there’s been no CO2 reduction in Germany in close to a decade. That’s some 300 billion euros for zero result. Wetzel adds that Germany has already reached its threshold of financial pain as electricity prices have soared to among the highest worldwide. Moreover reaching the target would also require going much more without meat, whose production is energy and CO2 intensive. Overall, Wetzel writes, reaching the 1.5°C target “collides with the fight against poverty and hunger” and , if the theory is true, there’s no chance of reaching the 1.5°C target. Gotta love the goalpost shifting (the magician suddenly pulling the rabbit of an additional 300 GT of CO2 emissions in the “world’s climate budget” out of his climate policy hat). When you’re driven by strong confirmation bias, anything goes. The associated remaining budget is being depleted by current emissions of 42± 3 GtCO2 per year (high confidence). The choice of the measure of global temperature affects the estimated remaining carbon budget. Using global mean surface air temperature, as in AR5, gives an estimate of the remaining carbon budget of 580 GtCO2 for a 50% probability of limiting warming to 1.5°C, and 420 GtCO2 for a 66% probability (medium confidence). Alternatively, using GMST gives estimates of 770 and 570 GtCO2, for 50% and 66% probabilities,15 respectively (medium confidence). Uncertainties in the size of these estimated remaining carbon budgets are substantial and depend on several factors. Uncertainties in the climate response to CO2 and non-CO2 emissions contribute ±400 GtCO2 and the level of historic warming contributes ±250 GtCO2 (medium confidence). Potential additional carbon release from future permafrost thawing and methane release from wetlands would reduce budgets by up to 100 GtCO2 over the course of this century and more thereafter (medium confidence). In addition, the level of non-CO2 mitigation in the future could alter the remaining carbon budget by 250 GtCO2 in either direction (medium confidence). Just in case you didn’t bother to read the report or didn’t try to confirm what the authors says is true. I suppose so. You’ll see fakery and goalpost shifting everywhere. “medium confidence” Just what does that mean? How do they decide these confidence levels? It is in fact down to what is described as “expert opinion” and who are the experts, why those who wrote the report. The folks without clean drinking water and Vitamin A don’t care a whit for these goalposts nor whether they are moving or not. Nature produces 96% of all co2 in the atmosphere. How much of the increase does nature contribute? Fair enough. The IPCC and globalist elitists care nothing for them. What a deal! Pretty soon the rest of the developed world will want to pay through the nose for zero results too. The author (Wetzel) didn’t write anything about no CO2 reductions in Germany nor 300 billion Euros for zero results. That’s added opinion stuff by Pierre. And that happened despite the decrease in nuclear power generation. P.S. : Investments of 900 billion dollars per year sure sounds like a lot. But what is that in percent of the global GDP? Barely over 1% … don’t you think the world can invest (it’s not like the money gets removed from the economy) this much in “saving the planet” and/or transitioning to a much more sustainable economy? What other expenses are in the 1% of the GDP zone? Care to look it up? The author (Wetzel) didn’t write anything about no CO2 reductions in Germany nor 300 billion Euros for zero results. Even the Berlin Energiewende-based think-tank Agora Energiewende projected that it won’t be a near miss – but a booming failure. As Peter Rez at Arizona State University discusses, renewables will not make much of a dent in their [Germany’s] total carbon emissions. The problem is that even when renewables produce enough energy to supply all of the country’s electricity, the variability of the renewables means Germany has to keep the coal plants running, over half of which use the dirtiest of all coal, lignite. In fact, in 2016, 7 out of 10 of Europe’s biggest polluters were German lignite power plants. European Union carbon emissions grew 1.8 percent in 2017 despite a 25 percent increase in wind power and 6 percent growth in solar, figures show. The European statistics body Eurostat this month reported that carbon dioxide emissions rose last year in a majority of EU member states. Germany, which is by far Europe’s largest polluter, accounting for 23 percent of emissions, also managed to improve its performance, but just barely. Germany posted a [massive!] 0.2 percent improvement on 2016 levels of carbon dioxide. don’t you think the world can invest (it’s not like the money gets removed from the economy) this much in “saving the planet” and/or transitioning to a much more sustainable economy? Considering emissions keep rising right along with wind and solar “investment”, and that fossil fuel infrastructure is preferred in developing countries, it doesn’t appear that most of the world agrees with you that the planet is in need of the salvation wind and solar provide, much less this “sustainable” economy that you keep on writing about. LOL – OK, Kenneth. You win. He does have a way to go yet before becoming an asset to them, …if ever. Yeah, think about how many more CO2 Germany would have emitted without renewables and not how much has been saved from the previous values. It might have worked without the forces phase-out of nuclear power plants. The problem is that even when renewables produce enough energy to supply all of the country’s electricity, the variability of the renewables means Germany has to keep the coal plants running, over half of which use the dirtiest of all coal, lignite. In fact, in 2016, 7 out of 10 of Europe’s biggest polluters were German lignite power plants. *sigh* Lignite is used in baseline power plants. They are not running the background waiting for the night or wind not blowing. Black coal power plants also aren’t regularly used as jump in backup power plant because of their slow reactions. Of course you can look all this up, but you are a skeptic, so you just believe whatever sounds right to you. European Union carbon emissions grew 1.8 percent in 2017 despite a 25 percent increase in wind power and 6 percent growth in solar, figures show. How much would it have grown if wind and solar would have stayed the same? That’s the problem with people. Unless they feel the consequences of their doing, they don’t act. Especially if that would mean rather large changes. Unfortunately we can’t wait until global warming reaches a much higher level. As you shouldn’t start doing sports and eat healthy only after you experienced your first heart attack. I strongly believe people don’t want to leave problems behind that their children will have to solve “some time”. That people want to be good and not throw their garbage out of the moving car on the street. They only need to get sometimes nudged this way a little bit. The small investments so far are those nudges. Doesn’t hurt too much, but had a great effect. And of course “most of the world” will prefer using the sustainable solutions when they become more economical than traditional power plants. As is the case in lots of the sunnier parts of this planet already. It’s getting there … the world will look quite different in 2030. That’s the problem with people. Unless they feel the consequences of their doing, they don’t act. Yes, how dare these people not do their part to change the weather. Change your light bulbs, people! Turn out the lights when you leave the room, you people! We can save the planet this way, of course. And these people just won’t do their share. Unfortunately we can’t wait until global warming reaches a much higher level. We can’t wait to do what? Oh. Act. Yes, we’ve got to do our part to change the weather now. Because if we don’t, disaster lurks. Just look at what’s already happened in the last 30 years: the Earth is significantly greener, not browner; more coastal land area is above sea level than has been submerged by sea level rise; Antarctica and Greenland have melted so little between 1958 and 2014 that together they contributed just 1.5 cm to sea levels; just one documented species has gone extinct since 2000 (even though 16 species per decade went extinction during 1500 AD to 2000 AD); hurricane frequencies, drought frequencies, flood frequencies…have been stable or diminishing; crop yields are exploding with the added CO2 and the extended growing seasons; penguin populations, polar bear populations…are growing. What is it that you think has happened in the last 30 years that is bad? Why do we need to act to stop the planet from greening and growing bumper crops and reducing cold-related deaths? I strongly believe people don’t want to leave problems behind that their children will have to solve “some time”. Correct. But it would appear we would disagree on what these problems we’re leaving behind for our children to “solve” are. They’ll be expected to “solve” the weather “problem” because we people didn’t adopt enough wind and solar into our energy mix or ride our bikes to work or give up meat? You assume that we agree with you that we are capable of controlling the weather by changing our use of fossil fuels. Doesn’t hurt too much, but had a great effect. Green energy transitioning has had “a great effect” on what? Reducing emissions? the world will look quite different in 2030. Indeed. Carbon emissions will likely be in the 15 GtC range rather than today’s 9-10 GtC range in 2030 as the demand for energy expands throughout the developing world and developed countries turn back to fossil fuels. I hope this paragraph was your attempt at sarcasm. While everyone can do something to limit their resource footprint, what I meant by this was mankind as a whole. Changing your lightbulbs at home won’t change how the energy you consume gets “produced”. Just look at what’s already happened in the last 30 years: […] What is it that you think has happened in the last 30 years that is bad? Great, but it’s not about the last 30 years. It is about what will happen in the next century(-ies) if we continue on this path. But it would appear we would disagree on what these problems we’re leaving behind for our children to “solve” are. You assume that we agree with you that we are capable of controlling the weather by changing our use of fossil fuels. Nope, you and me don’t agree on this. Or were you saying that because a few people like President Trump exist that we as the whole mankind don’t agree? So you predict carbon emissions will increase by the same amount in 12 years as they have been increasing in around 40-50 years? And you also predict developed countries will turn back to fossil fuels. Alright then, that are solid Kenneth claims right there. Not something you just repeated from others. Correct? So let’s see if you turn out to be correct in a world with rapidly decreasing solar/wind costs and an EV being the best sold luxury middle class car in the US, the number one car regarding revenue in the US is also that same EV and it is the fourth best selling car overall. So yeah, people will turn back to fossil fuels after the experienced the future … I don’t think so! I have to correct myself. Trump apparently now doesn’t deny climate change anymore (calling it a Chinese hoax), instead he just says he doesn’t know if it is caused by human emissions and that it will change back. Whatever that means. Not a Trump guy myself, but it is rather encouraging to see that so many of our NTZ articles have made their way onto Climate Depot…. “.. meat, whose production is energy and CO2 intensive.” ? Isn’t meat produced from grass eating animals? Doesn’t grass grow better and faster when there is more CO2 in the air around it? The world population of the genus homo-sapien has increased several billion in the last century. Has the world population of other species of animals increased to the same extent? Australian sheep numbers have declined by 100 million in the last two decades. whilst kangaroo numbers have increased by about an estimated 15 million and other native species are supposedly in decline. Bovine species have declined about 3 million in the last few years. Tillage of soils, to plant more grasses and forage (all CO2 consuming), has been reduced in the last few decades by adopting zero or reduced tillage methods. If we reduce consumption of meat means less slaughter of these animals hence increased numbers. So what plan do the do-gooders have to stop numbers increasing? Particularly the homo-sapien genus now in plague proportions more so than all other species. This post is about IPCC experts’ statements and their supporting calculations. Of course they had to come up with a “larger Carbon Budget / more time” to save the planet, since their doomsday clock had already rung “game over”. LOL. Fast forward a few more years, when the human CO2 emissions trajectory is failing miserably to achieve a sustained reduction of 3+ % year on year. What do you think the experts will do in order to save face? I spent the time and copied from that report the relevant passages. Please spend some time to read those passages before ranting about “saving face” and stuff like that. That would have been nice, instead of imitating a certain comment author by LOLing around and trying to look at everything out of context. And you except us to be impressed? What you do in the privacy of your own padded cell is entirely your business. Impressed by what? The actual wording of those footnotes and the text around those footnotes? “..updated understanding and further advances in methods..” So their claims in past editions have been wilder guesses than at present eh Seb? And as Kurt says above ‘fakery and goalpost shifting’ how true of their report. Any wonder we are so skeptical? So a person with an IPAQ PDA behind him asks some other person who has not read the report about the report. I only listened to the first 5 minutes before I had to stop this, but he starts with off with how people misunderstand him. But then he argues that what those reports (or AGW proponents) say is that the planet will end, that we all are going to die. Which is a pretty profound misunderstanding right there, wouldn’t you agree? Using the fact that a certain place was once under miles of water and once under miles of ice and the planet is still there, to counter that climate science is saying that it will get warmer and it will be more difficult to adapt than doing something against it now. He specifically says “we have dealt with sea level rise/ice” … no, we haven’t. Nobody was living at that place at those times. Nobody dealt with this. But we all will have to deal with the consequences of climate change. At the end of the part I listened too he says something about “give us all your money or we are going to die”. Nope, that doesn’t sound very sober or sensible. But, he at least admits that the reply from “us” (I assume skeptics) is a reflexive one. Even though everything might be real, you just don’t want to believe that it’s real because of the way it is presented or something like that. Is that true? He specifically says “we have dealt with sea level rise/ice” … no, we haven’t. Nobody was living at that place at those times. Nobody dealt with this. But we all will have to deal with the consequences of climate change. Yes, of course we have to deal with the consequences of climate changes. We always have. When sea levels were 120 meters lower than they are now 20,000 years ago, and then sea levels grew at rates of 5 meters per century at the beginning of the Holocene, humans and animals adapted. 5,000 years ago, the Sahara was green and had lakes teeming with fish and now-extinct marine species…before the humid period ended abruptly and total desertification took place within a few hundred years. During the 30 years between 11,490 and 11,460 years before present, the region which is now Poland had temperatures rise by 5.7°C, or 1.9°C per decade, to temperatures 2.7°C higher than they are now (Kolaczek et al., 2018). Droughts used to last 100s of years. The Arctic was ice free during the summers. And on and on. Today’s climate changes are piddling compared to what’s occurred that we humans have had to “deal with” in the past. Even though everything might be real, you just don’t want to believe that it’s real because of the way it is presented or something like that. Is that true? We don’t agree that humans can exert fundamental control the weather and climate (and glacier melt and sea level rise and hurricane intensities or drought severity…) by increasing or decreasing our CO2 emissions, no. There is a difference between a few thousand people moving their simple small villages/settlements inwards and hundreds of millions of people living in coastal regions. Today’s climate changes are piddling compared to what’s occurred that we humans have had to “deal with” in the past. Again, the point is not “save the climate or we are all going to die”. This “but it was warmer/cooler/more extreme” in the past meme is really getting old. That is not an answer to that question. Are you a skeptic because that is your reflexive answer to being told what is happening? Can’t believe the “elite”, the “experts”? Rather listen to your own experts? The person in the video is basically saying that skeptics are in denial because they are being talked to like kids, not adults. They don’t like to eat the spinach the parents say is good for them. Is that true? Some commentators here expressed/implied that this is a partisan issue. If they are more right leaning, and someone who they perceive as “leftist” says anything, they reflexively claim the exact opposite of whatever it was. So if you are a US republican you nowadays believe that human emissions aren’t responsible for the observed climate change. It has been made a partisan issue talking up about the non-existing consensus, scientists have been marginalized for their views, you call us deniers and not skeptical which goes with the saying. There might even be some reflex claims against the poison that is being spread. You think we are the poison, we sometimes have the feeling you are, while in reality we are not and you are not either. We live on opinion pieces and some are more backed up by science, I’d hazard a guess, Kenneth way more than yours. If you had a blog, how would it look like??? Human emission are not responsible for a measurable climate change, and you have not been able to support that claim with a scientific paper, nor have you explained he mystical “mechanism”. Its time to stand up or shut up. I’d like to hear what you have to say! There is real science backing the Green House Gas Effect, and the IPCC covers none of it. The question needs to be asked, “why are the models so wrong?” If I was going to model Weightloss and the variables I included in the model were # of Pens in home, area of driveway, distance one lives from Florida, I would expect my model to produce results like the IPCC Models. If you don’t include and weight the correct factor, you will never develop an accurate model. Everything regarding CO2 and its impact on global climate must revert back to CO2’s one and only mechanism by which to affect climate change, that being the thermalization of LWIR between 13 and 18 microns. That is the only defined mechanism for CO2, and therefore every observation must be explained in that context. LWIR between 13 and 18 won’t melt ice or warm water, in fact ice emits LWIR of around 10 microns, and very cold ice will emit LWIR between 13 and 18 microns. There is also only a limited amount of LWIR between 13 and 18 microns emitted by the earth and 100% of it is “trapped” by CO2 and H2O by the altitude of 5 feet. More CO2 would simply lower that level slightly towards the surface, but with the convection of the lower atmosphere, that becomes meaningless. Simply use MODTRAN, double CO2 in the atmosphere and measure the impact on the lowest 0.1km of the atmosphere. It has no impact.None, Nada, Zip. Focus on the significant factors. The oceans clearly dominate the climate, the oceans are warming, the oceans aren’t warmed by LWIR between 13 and 18 micron. What is warming the oceans is warming the climate, and what is warming the oceans is more incoming visible light, especially on the blue end of the spectrum. To warm the oceans you need fewer clouds over the oceans or a hotter sun, or both. The IPCC doesn’t focus on those factors so they will never have an accurate model. Nobody is saying that this is how the GHE works. Also a completely wrong picture of what more CO2 does to the effect. You are arguing against straw men. The oceans clearly dominate the climate, the oceans are warming, the oceans aren’t warmed by LWIR between 13 and 18 micron. Again, this is not how the GHE works. What is warming the oceans is warming the climate, and what is warming the oceans is more incoming visible light, especially on the blue end of the spectrum. To warm the oceans you need fewer clouds over the oceans or a hotter sun, or both. What is warming the oceans is the radiative forcing imbalance created by increased CO2 concentration levels. While it is true that fewer clouds allow for more sunlight to hit the oceans, it also means less backradiation from clouds. A hotter Sun has not been observed. In fact, the Sun’s activity has been falling for quite some time now and OHC is still increasing. What is warming the oceans is the radiative forcing imbalance created by increased CO2 concentration levels. So how much warming in the oceans is caused by a 0.00006 (60 ppm) increase in atmospheric CO2 concentration (the increase since the 1980s)? Is it 0.0000001 K? Is it 0.000001 K? 0.0001 K? 0.1 K? 1.0 K? What has scientific observation determined? Do you have those figures for us so that we can check your claim for accuracy? Or is it just enough to make the claim that the warming of the oceans is caused by CO2 concentration changes without having the observational measurements to quantify this effect? From the late 1970s to about 2010, there was a 3.6% to 6.8% change (reduction) in decadal-scale cloud cover. This translates to a +2.3 to +5.4 W m-2 imbalance in the radiation budget from cloud cover changes, which is more than enough of a causal mechanism to explain the temperature increases. So how much warming in the oceans is caused by a 0.00006 (60 ppm) increase in atmospheric CO2 concentration (the increase since the 1980s)? Is it 0.0000001 K? Is it 0.000001 K? 0.0001 K? 0.1 K? 1.0 K? What has scientific observation determined? The heat content increase from 1980 to today is about 22*10^22 Joules. Which amounts to an average forcing of 0.52 W/m² over the timespan and area of the oceans. The imbalance is in the same ballpark, so we can attribute the increase to CO2 forcing. And how much did the downwelling LWIR change because of the reduced cloud cover? The net forcing of clouds is not 79 W/m² … you should know that given that we had lengthy discussions about the net forcing of clouds and you put it in the -20-ish W/m² region. Some put it even at around -10 W/m². The heat content increase from 1980 to today is about 22*10^22 Joules. Yes, we know you believe that CO2 caused the “observed” change. That’s like saying someone believes seismic activity caused the ocean temperature change, and to demonstrate this causal relationship, he says that the temperature changed by ___, seismic activity is the cause, and therefore seismic activity caused ___ temperature change since 1980. This is what we call circular reasoning using hypothetical scenarios…but then claiming it’s scientific observation. My question an empirical one: in real-world observation, how much water temperature change does a 60 ppm change in the air above the water body cause? What’s the quantified result from a real-world observation? Your response just assumes that 100% of the change in water temperatures is caused by CO2…even though we have yet to see the quantified effect of CO2 concentration changes on water temperatures from a real-world measurement. We’re not accepting assumptions here and then counting them as scientific observation because they fit the paradigm you espouse. That’s like saying someone believes seismic activity caused the ocean temperature change, and to demonstrate this causal relationship, he says that the temperature changed by ___, seismic activity is the cause, and therefore seismic activity caused ___ temperature change since 1980. No, that is not the same. My question an empirical one: in real world observation, how much water temperature change does a 60 ppm change in the air above the water body cause? What’s the quantified result from a real world observation? You can’t observe such a thing, because we can’t construct an experiment to observe it. That is the whole point of your question as outlaid previously. It is designed so there can be no answer and you can repeat asking it forever. You win! CO2 doesn’t cause warming in bodies of water or very little warming. Feel free to tell that to yourself and use this construct to base you skepticism on. SebastianH’s circular reasoning: That’s like saying someone believes seismic activity caused the ocean temperature change since 1980. To demonstrate this causal relationship, he says that the temperature changed by ____, and because seismic activity is the cause, therefore seismic activity caused ___ temperature change since 1980. You win! CO2 doesn’t cause warming in bodies of water or very little warming. But let’s say I agreed with your assumption that it does cause warming in water bodies. This wouldn’t clear anything up unless we know how much, quantified, this warming effect is. If it’s only 0.00000001 K with +60 ppm CO2, that’s a heating effect (i.e., it’s not nothing), but it’s so negligible that it’s not worth even considering. If it’s 0.001 K, then that’s perhaps not negligible, but we don’t know if it’s 0.000000001 K or 0.001 K because we have no real-world measurements to verify either quantified result. This is why your logically fallacious circular reasoning (The oceans warmed by ____ since 1980. CO2 concentration increases are the cause of ocean warming. CO2 concentrations rose by 60 ppm since the 1980s. Therefore, 60 ppm CO2 concentration increases cause ___ warming in water bodies.) is not even remotely scientific. I know you think it’s no big deal that we don’t have observational evidence to confirm and quantify the CO2-heats-water paradigm, but it is a big deal for skeptics. We need evidence to be persuaded. But let’s say I agreed with your assumption that it does cause warming in water bodies. This wouldn’t clear anything up unless we know how much, quantified, this warming effect is. We know how much from modeling it. And “modeling” is not something you should be afraid of since everything is a model these days. You can’t even measure temperature without a model. The imbalance can be observed, such an imbalance causes a certain amount of heat accumulation. How this heat content increase gets distributed is another story. This is why your logically fallacious circular reasoning (The oceans warmed by ____ since 1980. CO2 concentration increases are the cause of ocean warming. CO2 concentrations rose by 60 ppm since the 1980s. Therefore, 60 ppm CO2 concentration increases cause ___ warming in water bodies.) is not even remotely scientific. I agree with you. What you made up here as my “circular reasoning” is entirely coming from your imagination. That is not what I am saying and not how the CO2 greenhouse effect interacting with water bodies works. The CO2 increase caused by warming of the oceans is pretty small and not adding much to the imbalance. That CO2 is both lagging and leading temperature increases is part of the mechanism and nothing circular. Not at all. We know how much from modeling it. No, we do not “know” from models how much (quantification) real-world warming is caused in water bodies when the CO2 in the air above them increases by 0.00006 (60 ppm). The models are only as good as the observed, real-world measurements, of which there are none with regards to this particular question. Let’s say I claimed that the reason why the West Antarctic ice sheet has sections of pronounced warming was because of the high geothermal heat flux (volcanic activity) underneath the ice sheet. You have been the one who has claimed that it’s not primarily because of the geothermal heat flux that the melting occurs, as the observed, measured forcing value for this is too low (it’s measured in milliwatts!) and thus too negligible to account for the ice melt. Instead, you claim that it’s the ocean heat change that is responsible for the ice melt. Fair enough. Let’s compare the measurements. According to measured real-world results, the flux affecting the WAIS melt for ocean heat is about 0.7 W m-2, where as the flux for geothermal heat is 0.09 W m-2 to 0.3 W m-2, meaning the geothermal heat flux is roughly a third of the ocean heat flux. Why do you insist that we absolutely need to have real-world measurements of geothermal heat flux to establish the quantified extent to which GHF contributes to ice sheet melt (so that you can say it’s negligible or barely worth considering), but at the same time you insist that it’s not necessary to have the measurements of the effect of CO2 concentration changes on water temperature changes to establish that it is quite certainly the CO2 concentration changes that are the primary/100% cause of the ocean heat change since the 1950s? Do you not see the flagrant inconsistency here? You say models of hypothesized forcing are enough for us to claim CO2 change–>100% OHC change. Real-world measurements are not needed and anyone (a skeptic) who insists on having them is just engaging in game-play and questioning “the laws of physics”. But skeptics like us counter: The laws of physics require real-world observation of cause-effect. And we don’t have that if we cannot answer the question: How much (quantified) change in water temperature is elicited by an increase in the CO2 concentration by 0.00006? Is it 0.00000001 K? 0.000001 K? 0.0001 K? What’s the value? We don’t know? Well, then that’s a problem. Because it’s not OK to say we don’t have those measurements, but we know anyway. And that’s exactly what you are doing! The imbalance can be observed, such an imbalance causes a certain amount of heat accumulation. The imbalance can be observed…with uncertainty values that are more than an order of magnitude greater than the assumed imbalanced value itself! During 2000-2010, the radiative imbalance was “observed” to be +0.6 W m-2. The uncertainty for this value? +/-17 W m-2! So the radiative imbalance ranged anywhere from -16.4 W m-2 to +16.4 W m-2. 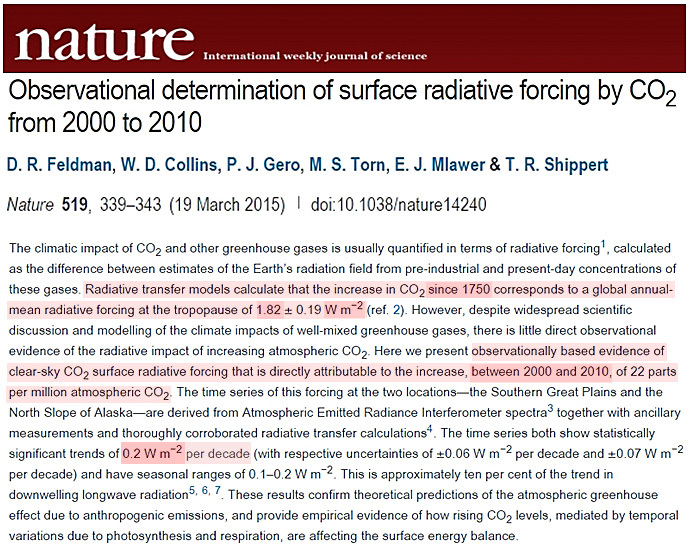 And you wish to claim that this effectively unknown imbalance — which could be as low as -16.4 W m-2 for all we know, given the uncertainty — has been observed, and therefore we know that CO2 caused it?! Do you have any skepticism here? Because with those error bars and that level of uncertainty, how in the world could it be anything other than an assumption what the radiative imbalance is, let alone that it’s the CO2 concentration change that caused it? This isn’t reasoning. These are merely assumptions based on non-real-world modeling! The uncertainty in the radiative imbalance is already ranging up or down by up to 34 W m-2. The radiative forcing attributed to the CO2 change (just 0.2 W m-2 from the +22 ppm CO2 during 2000-2010) is 2 orders of magnitude smaller than the uncertainty range. How can you possibly claim that you know it’s CO2 forcing when the alleged CO2 forcing is no more than noise in the cacophony of uncertainty? SebastianH, real-world evidence is needed. Observations, not modeled assumptions, are needed. Why not be more skeptical about what you believe to be true? As you wrote, the models are based on real-world measurements and the laws of physics. Did you know you can simulate nuclear explosions in great detail because of models? Did you know the thermometers you use are based on models, they can’t directly measure temperature. I don’t “need” measurements, they are literally the only thing we have when looking at the geothermal heat flux! How would you model this heat flux from a system you can’t observe? We don’t have any data from the energy inputs that feed those geothermal heat fluxes. We don’t know how much magma is coming from where without measuring it. So the only thing we can do is measure the heat flux. On the other hand we can measure a lot of things in our atmosphere and the oceans and infer – with the help of the laws of physics – what’s happening regarding heat content increase. Comparing it with geothermal heat flux, we can also just measure the heat content increase or the temperature. But since the atmosphere is accessible we also know where those changes are coming from and what is very likely causing them. Do you not see the flagrant inconsistency here? You say models of hypothesized forcing are enough for us to claim CO2 change–>100% OHC change. Real-world measurements are not needed and anyone (a skeptic) who insists on having them is just engaging in game-play and questioning “the laws of physics”. Well, do we have measurements of the process that causes the geothermal heat flux to be what it is at a certain location? Maybe some reptoids are causing it, who knows. Or are you just “believing” that Earth’s internal energy sometimes surfaces more violently than what is considered normal? But skeptics like us counter: The laws of physics require real-world observation of cause-effect. And we don’t have that if we cannot answer the question: How much (quantified) change in water temperature is elicited by an increase in the CO2 concentration by 0.00006? And that is an incorrect assumption. The laws of physics are based on observations and we did observe the physical properties of the system and the major parts that are involved. That’s what the models are based on. We also have models of how gravity works. Those are used to calculate paths for satellites, spaceships and probes. We have those models despite not being able to go out there and measure gravity around every object in space and test how stuff moves around those planets/moons/asteroids. We assume the laws we found out by observation hold true universally. If not we would be living in a very strange universe. We don’t know? Well, then that’s a problem. Because it’s not OK to say we don’t have those measurements, but we know anyway. And that’s exactly what you are doing! We can’t know! That is the problem and you are abusing it to make up an argument why you are skeptical about this mechanism that can never be resolved and thus you “win”. A very hollow win, but nevertheless you seem to enjoy it enough to repeat this over and over. As you noted yourself, the climate is mainly the oceans. Measuring the ocean heat content is basically measuring the imbalance of the input and output of Earth’s system. Even though we can’t determine the exact ocean heat content of the entire ocean with super great precission, we can measure relative changes quite well. And that’s more or less the imbalance. Do you have any skepticism here? Yes, definetely towards your way of thinking about this “problem”. This isn’t reasoning. These are merely assumptions based on non-real-world modeling! Those aren’t assumptions. What else but an imbalance of the in- and output can cause a change of the heat content of the magnitude we observe? Nothing internal can do that except maybe a hidden petawatt scale reptoid people reactor hidden from our views. The uncertainty in the radiative imbalance is already ranging up or down by up to 34 W m-2. How can you possibly claim that you know it’s CO2 forcing when the alleged CO2 forcing is no more than noise in the cacophony of uncertainty? Because the uncertainty isn’t as high as you believe it is. I already told you, you win! Take the hollow victory of nobody being able to measure what you demand. If you must, continue to repeat this question over and over. The rest of us trust in the laws of physics and models based on observations and those laws. The rest of us remains skeptical when some blog experts claim that climate science is a scam/fraud/whatever and they would know better because a random peer reviewed paper xy and their general opposition of people trying to explain them what is going on makes them reflexively object anything mainstream. As you wrote, the models are based on real-world measurements and the laws of physics. No, I did not write that the models that say that CO2 concentration changes are the cause of temperature changes in water bodies are based on real-world measurements and/or the laws of physics. Those are your assumptions/beliefs. I don’t “need” measurements, they are literally the only thing we have when looking at the geothermal heat flux! How would you model this heat flux from a system you can’t observe? We observe the heat flux from geothermal sources in the real world. That’s how we determine or measure the extent to which (i.e., quantify how much) geothermal heat influences subsurface glacier and ice sheet melt. We don’t observe CO2 concentration increases causing water temperatures to rise in the real world. And because we don’t have real-world observations, we don’t have measurements of how much (i.e., quantification) CO2 concentration increases cause water temperature changes. For all we know, it could be just 0.00000000001 K for a 60 ppm increase in CO2. It could be even less than that: 0.00000000000000000001 K. Or, it could be more: 0.001 K. We don’t know because we have no real-world, quantified measurements to assess CO2’s actual influence. To you, this isn’t a problem, as you just assume/believe that the CO2 concentration increase is the 100% cause of the ocean heat content change since the 1950s anyway, without even knowing how much real-world influence CO2 concentration changes have on water temperatures. We also have models of how gravity works. Yes, but unlike the assumption-without-measurements stance that says CO2 increases have caused 100% of the ocean heat content change since the 1950s, we do have real-world, quantified measurements for the cause-effect of gravity forcing. We can measure how long it will take a bowling ball to reach the surface from a specified height above the Earth due to gravity forcing, and this measurement can be generalized throughout the lower atmosphere. A model isn’t needed for these measurements. It’s real-world datum, and the quantification is obtainable. What else but an imbalance of the in- and output can cause a change of the heat content of the magnitude we observe? OK, then surely you can answer this question you keep dodging every time I ask: The temperature of the 0-700 m Pacific Ocean plummeted by -0.9 C between 1000 AD and 1600 AD per Rosenthal et al. (2013, 2017). What was the mechanism or mechanisms that caused that magnitude of radiative imbalance that led to this abrupt -0.015 C per decade water temperature change? Since you’ve acknowledged previously that it wasn’t due to the atmospheric CO2 change, what was the causal mechanism, then? Be specific. Was it solar forcing? Volcanic forcing? Cloud forcing? What? Nothing internal can do that except maybe a hidden petawatt scale reptoid people reactor hidden from our views. Why do you choose to add these little cheap shots in your comments? Why can’t you just treat people with civility and respect rather than routinely stooping to this level? It’s just rude to make up these you-guys-are-so-dumb-you-probably-think-reptoid-people-cause-water-temperature-changes barbs. What do you get out of this? Do you think it helps your standing here? At this point I have to ask: what do you think models are? We don’t observe CO2 concentration increases causing water temperatures to rise in the real world. Those two claims are not the same. We don’t observe what is causing geothermal heat flux. We don’t know because we have no real-world, quantified measurements to assess CO2’s actual influence. You can’t possibly believe that at some point in this mechanisms something happens that completely defies the laws of physics and the energy just vanishes (into space?). We can observe all parts of this mechanism, nothing is suggesting that this might be the case. So you are suggesting we shouldn’t trust anything that we have not measured? Oh boy … so we can send probes to the outer planets only after we send measurement instruments there to confirm the laws of physics work there as well? Well, I gave you that win already. You don’t need to repeat it over and over. If you think that is the case, go with it. You also think humans didn’t cause the CO2 concentration increase for some reason. Go with that too … it’s what skeptics do. we do have real-world, quantified measurements for the cause-effect of gravity forcing. So do we have measurements of what CO2 does, only not what it does to a body of water in an Earth like system. Why? Because that is near impossible to measure without a second Earth or something like that. We can measure how long it will take a bowling ball to reach the surface from a specified height above the Earth due to gravity forcing, and this measurement can be generalized throughout the lower atmosphere. A model isn’t needed for these measurements. It’s real-world datum, and the quantification is obtainable. This is interesting. So you agree that you can measure gravity in a different context and apply the results to another situation (a space probe flying to Jupiter for example). Probably because you also agree that the laws of physics are universal. Why is it so hard for you to make this step in regards of CO2 forcings? Oh, a quantification of the CO2 effect on a whole atmosphere is also obtainable. Just set up two Earths and add a defined amount of CO2 to the atmosphere of one of them. See? Very easy! Now try to obtain the quantification of the gravity experienced by a random object at close proximity to the nearest blackhole! You can’t! You use the model you made from observing gravity elsewhere to infer what will happen in such a scenario! What was the mechanism or mechanisms that caused that magnitude of radiative imbalance that led to this abrupt -0.015 C per decade water temperature change? Since you’ve acknowledged previously that it wasn’t due to the atmospheric CO2 change, what was the causal mechanism, then? First, the Pacific is big but it doesn’t cover the whole planet. Also the average rate of change over that period seems to be smaller than the modern rate. I don’t know what caused this and I won’t look it up for you. Be specific. Was it solar forcing? Volcanic forcing? Cloud forcing? What? Ok, this question seems to be designed to suggest that when it was solar forcing, volcanoes, clouds or something else in the past then it can be those things today as well. Correct? Why do you choose to add these little cheap shots in your comments? Why can’t you just treat people with civility and respect rather than routinely stooping to this level? Do you think it helps your standing here? In climate science, the models are often slightly better than worthless. You can’t possibly believe that at some point in this mechanisms something happens that completely defies the laws of physics and the energy just vanishes (into space?). Considering the “energy” has not been measured to have a real-world effect on water temperatures due to a lack of observational evidence (i.e., we have no quantified measurement of the effect of CO2 concentration changes on water temperatures — a +60 ppm CO2 change could yield a 0.00000000001 K difference or a 0.001 K difference for all we know), there are no “laws of physics” here that are violated and no determinable (real-world) energy that “vanishes”. It’s hypothetical. Trust? SebastianH, we have no idea if the effect of adding 60 ppm CO2 to the atmosphere yields a 0.00000000000000000001 K temperature change or a 0.00001 K temperature change. We have no measured value. We have no observations. So which quantified value should I trust in? Which do you believe is more accurate? 0.00000000000000000001 K or 0.00000000001 K or 0.001 K or…what? If we have no measurements of what effect CO2 has on temperature changes in water, then anything said about the effects of CO2 change on water temperature is an assumption. Assumptions are not “the laws of physics”. So do we have measurements of what CO2 does, only not what it does to a body of water in an Earth like system. So if we don’t know what CO2 does (real-world observational measurements) to water temperatures when its concentration is changed by ___ ppm, then we don’t know if the effects of CO2 forcing are negligible (i.e., 0.0000000000000001 K for +60 ppm) or transformative (i.e., 0.1 K for +60 ppm). Without measurements, all we have are guesses and assumptions and hypotheses. And the uncertainty is gargantuan. But you don’t need measurements. Belief is enough. Probably because you also agree that the laws of physics are universal. Why is it so hard for you to make this step in regards of CO2 forcings? Because the causal effects of “CO2 forcings” have not been observed or (more importantly) quantified. Therefore, they are no more the “laws of physics” than saying geothermal heat flux causes Antarctic ice sheet basal melt. If we don’t know/can’t measure the effects of geothermal heat on basal ice melt, then we are merely assuming geothermal heat flux is the cause of Antarctic ice sheet basal melt. CO2 forcings have not been elevated to “the laws of physics” except for in your mind. First, the Pacific is big but it doesn’t cover the whole planet. Rosenthal et al. (2017) suggested their reconstruction was representative of the global ocean and directly compared it to the Levitus et al. (2012) data supposedly representing the global ocean heat content. Also the average rate of change over that period seems to be smaller than the modern rate. Do you consider yourself a skeptic? If yes, would not a skeptic want to learn as much as possible about the mechansims that caused OHC changes in the past so as to consider whether or not these factors are capable of having a similar effect today? Or is this not important to you because…CO2 did it today, so it doesn’t matter what did it in the past? No. I’m just curious to know if you have even the least bit of curiosity or interest in learning about the mechanisms that cause ocean water temperatures to change that are not CO2. I don’t have the impression that you are curious…or that you even question what you believe. So pardon me for bringing reptoids into this, I had no better placeholder for something that might be going on hidden from our views. Do you really think we skeptics believe that reptoids cause water temperature changes? No? Then writing that is dishonest, rude, and uncivil. Raise the bar, SebastianH. DEFYING THE LAWS OF PHYZIKS?